For over a decade, David Jansen was the chef de cuisine at the legendary Fountain Restaurant at Philadelphia’s Four Seasons Hotel… But then he simply dropped out of sight (an extended vacation of sorts) to spend time with his family. He’s back now, however, with his eponymous Mt. Airy restaurant making significant blips on the culinary radar screen. His current domicile will never match the overwrought glitz and glitter of what was the Four Seasons. On the other hand, the three hundred-year-old handsome stone structure is infinitely less intimidating. The 72-seat interior has been tastefully renovated with whitewashed walls, crisp white napery and strikingly contrasting blue draperies supplemented by a lovely walled outdoor garden. 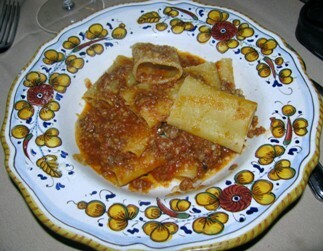 It absolutely looks the part of a casually laid-back fine dining establishment; and, for the most part, Mr. Jansen – and Francesco Martorella, his former compatriot at the Four Seasons – deliver on the restaurant’s promises. 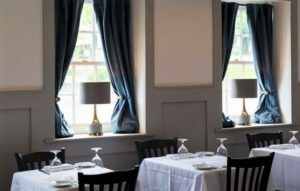 The food, while not cutting-edge, could best be described as thoroughly approachable upscale comfort cuisine, which appears to be a perfect fit for the slightly conservative gastronomic inclinations of the Mt. Airy & Chestnut Hill dining sets. 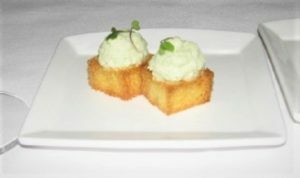 And the amuse-bouche sets the tone – on one occasion, salmon mousse on brioche; on another, cauliflower mousse on toast (pictured) – just exotic enough to tickle the taste buds without overwhelming the eye. The appetizer course is comprised exclusively of seafood, Jumbo Lump Crab, Shrimp and Lobster Cocktails, respectively, as well as Half Dozen Oysters with mignonette and house-made cocktail sauce, and a luscious Tuna Poke companioned by soy wasabi glaze and ginger-scented pineapple. 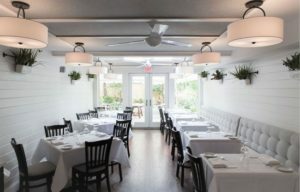 If you’re prefer not to go the seafood route, however, the first course is where you’ll find select salads, soups, and “baked” Oysters. Of particular note is the presentation of Heirloom Tomatoes garnished with arugula and homemade focaccia. 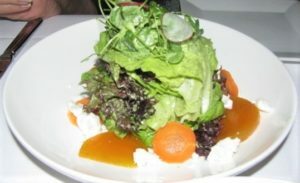 Even better, though, is the Boston Lettuce and Lola Rosa (red leaf lettuce) garnished with a variety of pickled vegetables, morsels of creamy goat cheese, and splash of irresistible green goddess dressing (pictured). 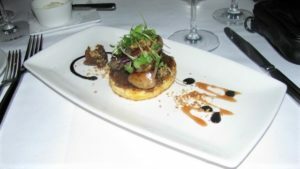 … But the real winner among the starters is the daily presentation of Foie Gras. You never know what Mr. Jansen is going to come up with, but it is inevitably decadently delicious and beautifully presented. On one occasion, for example, the silky-smooth liver is presented on a bed of lentils and gnocchi; on another, it arrives on brioche companioned by a rich date jam (pictured). And one of the best ways to enjoy this luxury starter is as my dining partner and I did… by ordering a salad along with the Foie Gras, sharing a bit of each, and allowing the acidity of the salad dressing to balance the richness of the liver. There are a select number of entrées noted on the printed menu – seven to be precise. These include various incarnations of lamb and pork, free-range chicken breast, Vietnamese hot pot and, during my several visits, three seafood selections. The kitchen also throws in a few daily specials just to spice things up. From what I’ve observed, seafood does appear to be the restaurant’s strong suit. 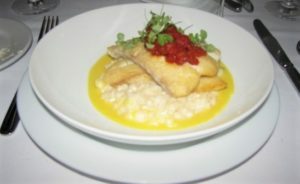 Typical is the stellar presentation of Lemon Sole. The filets are perfectly pan-seared to a golden brown, beautifully textured, set on a seabed of creamy risotto awash with crunchy rock shrimp, and finished with tangy lime emulsion. There’s just enough going on to complement rather than overwhelm the sole’s delicate disposition. And the Alaskan Halibut is yet another example of Mr. Jansen’s piscatorial prowess. 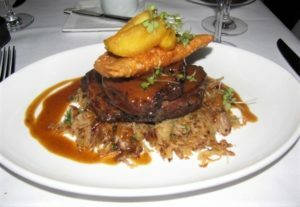 The filets are gently sautéed, leaving the interior pristinely white, moist and flaky. Members of the supporting cast include a colorful tiara of tomato compote, pillow of sweet garlic risotto, and pool of aromatic saffron fumet (concentrated stock). Once again, the accoutrements are judiciously applied, gently caressing rather than smothering the object of their affections. But what next transpired illustrates how a first-class restaurant handles complaints. Mr. Jansen happened to be circulating through the dining room at the time, stopping at our table to inquire about the problem. When I explained, he immediately apologized, asked if I would like to order another entrée – which I did, the special sole on a bed of garden vegetables – and then whisked away the pork. The sole appeared in a very short period of time and was perfectly prepared. My dining partner had ordered sautéed scallops that evening. And, shortly after my sole arrived at table, so did our server with two additional scallops for her plate. A very nice touch, indeed. Desserts, courtesy of pastry chef Angela Irwin, were right back on track. Her Bread Pudding garnished with maple ice cream was excellent; her Chocolate Pound Cake with vanilla ice cream even better (pictured). And if you’d prefer something on the lighter side, the Ice Cream/Sorbet Trio – poached pear sorbet, cranberry sorbet & caramel ice cream comprised the most recently sampled triptych – is always worth a look-see. Managers Kevin Keys, of the late Le Bec Fin, and Simon Dean, have put together a short but select & moderately priced wine list that presents diners with a number of interesting possibilities. By the glass, for example, the 2016 Franciscan Chardonnay is an excellent value at $12.00… ditto the 2016 Chad Pinot Noir from Oregon’s Willamette Valley at $16.00. Bottle-wise, the 2015 Heddesdorff Riesling “Trocken” (Dry) from Germany’s Mosel Valley is a steal at $54.00, while 2016 Domaine Bonhomme Viré Clessé “Vielle Vignes” is a first-class white Burgundy priced at $86.00. The wine list tops out at $325.00 for 2013 Caymus Vineyards “Special Selection” Cabernet Sauvignon and $400.00 for the 2010 Château Lynch Bages from the Pauillac region of Bordeaux. Given the monetary and oenological excesses of some pretentiously showy restaurant wine lists, these prices are modest, indeed. The service is commensurate with the ambiance – casually sophisticated. It’s professional without being stuffy… friendly without being uncomfortably familiar… and always at the ready without hovering over your shoulder. Like all the other aspects of this charming restaurant, it seems to function effortlessly without self-consciously trying to do so. An occasional faux pas notwithstanding, Jansen is love at first bite.